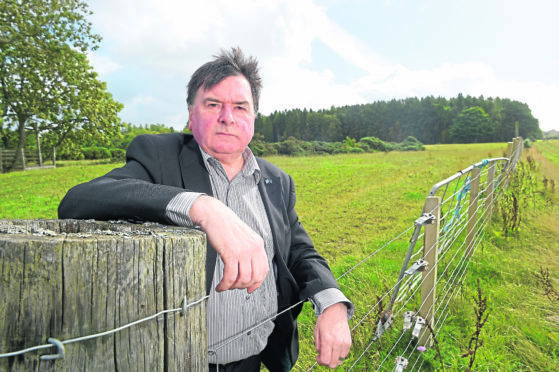 Councillor Ken Gowans in the Inshes area of Inverness where it is proposed to have over 500 timber lorry movements as Balvonie Wood is cut for timber. Locals have voiced concerns over a plan to allow hundreds of lorryloads of felled trees to drive past a primary school and through a residential development. The woods at Balvonie, Inshes, need to be felled because the trees have reached a height where they risk falling in windy conditions. The wood is in private ownership and has now become hazardous to the walkers and cyclists who enjoy it on a daily basis, says management company Scottish Woodlands. Forestry Commission and Highland Council officers agree that felling is necessary and all parties are looking at options for hauling the timber out of the area. Around 240 lorry loads would come out, with the same number returning empty, over a six month period from spring to September next year. The company initially agreed with the neighbouring farmer to upgrade his track and haul via Balvonie Road, Cloverfield Road, Inshes Road, and the Southern Distributor road to the A9. Mr Taylor said they are now in talks with Highland Housing Association to haul through the former Highland Housing Fair site almost directly onto the A9. Local councillor Ken Gowans said he was completely opposed to the idea of hauling the timber through residential areas. He said: “The proposal to route 240 heavy loads past Inshes Primary School, on what’s called a Safe Route to School, presents very obvious high risks and is completely unacceptable. “Cloverfield Road is not even adopted as it’s not to standard so I’m worried about damage to the road from the heavy vehicles delaying any adoption by the council. Mr Taylor said Scottish Woodlands will hold a public consultation by the end of the year over the haulage issue and the plans for the wood, which will be replanted and reinstated as a community amenity.